When asked whether Mister Rogers would have approached the situation the same way the activists did, one of the protesters said, "I'm not Mister Rogers." A group of protesters accosted Florida Attorney General Pam Bondi outside the screening of the new documentary about Mister Rogers at the Tampa Theatre on Friday night, questioning her about her recent actions on health care policy and her stance on immigration. "What would Mister Rogers think about you and your legacy in Florida? Taking away health insurance from people with pre-existing conditions, Pam Bondi!" Maria José Chapa, a labor organizer, can be heard yelling to Bondi in the video. "Shame on you!" "You're a horrible person!" another protester shouts. Reached by phone on Saturday, Bondi said the sudden protest didn't square with the lessons imparted by Fred Rogers. "We were in a movie about anti-bullying and practicing peace and love and tolerance and accepting of people for their differences," Bondi said. "That's what Mister Rogers is all about. We all believe in free speech, but there's a big difference there." 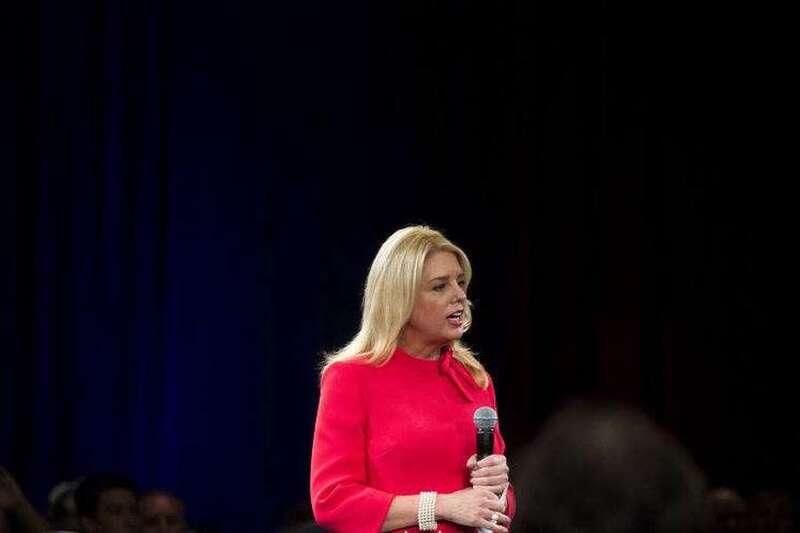 Tampa Police Department public information officer Janelle McGregor confirmed the department got a call from Florida Highway Patrol asking for help escorting Bondi out of the Tampa Theatre. "We responded at approximately 8:06 P.M. as the showing was ending and there were no further incidents," McGregor said. After this story was first published online Saturday afternoon, a Bondi spokesman recounted a much less pleasant story of the attorney general's interactions with the protesters. "The video they are choosing to share is of the least aggressive portion of the attack that transpired after police arrived to control the scene. What they are not sharing publicly are several previous encounters involving large men getting in the Attorney General's face, spitting and blocking her exit," the spokesman, Whitney Ray, said in an emailed statement. "The Attorney General tried to have a conversation with these individuals, however, when it became abundantly clear that they were not interested in a constructive dialog but were only there to cause a scene, the attorney general tried to leave the volatile scene." During an appearance on Fox News Monday, Bondi clarified that she didn't know if she was spit on intentionally or if spit came out while someone yelled at her. A spokeswoman for the Tampa Theatre said there are no security cameras that could have captured the incident. Chapa called Bondi's latest version of events a "lie," contending that there were no large men in her party. When asked whether Mister Rogers would have approached the situation the same way the activists did, Chapa said he might have handled it differently. "I'm not Mister Rogers," Chapa said. "I don't have the poise or temperament of Mister Rogers." It was the latest confrontation between a prominent conservative public official and liberal activists. Department of Homeland Security Secretary Kristjen Neilsen was shouted out of a Mexican restaurant in Washington D.C. earlier this week. And President Trump's press secretary Sarah Huckabee Sanders tweeted Saturday morning that she was refused service by a restaurant in Virginia on moral grounds. Heberlein, who accused Bondi of refusing to start a dialogue with groups that work with at-risk communities like his, said he has no regrets about how the protesters acted. "If you refuse to meet with us, we're coming to where you're at. We're coming to where you're watching a movie or eating dinner," he said. "Sorry, not sorry." This story has been updated with additional information about AG Bondi's version of events.